The Roundtable. : Down these mean streets — of London? Down these mean streets — of London? 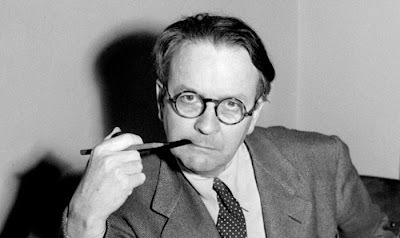 Raymond Chandler was born on July 23, 1888. On the 125th anniversary of his birth, we take a look at the origin of his most iconic phrase, "mean streets." Who actually coined it, and who used it in a story first? Raymond Chandler is almost always cited as the man who coined the phrase "mean streets." His essay, "The Simple Art Of Murder," contains the oft-repeated quote: "Down these mean streets a man must go who is not himself mean, who is neither tarnished nor afraid." The essay first appeared in The Atlantic Monthly in 1944 and was reprinted in an anthology in 1950 under that same title. The Library of America, on its page about Chandler, writes: "In his first novel, The Big Sleep (1939), the classic private eye finds his full-fledged form as Philip Marlowe: at once tough, independent, brash, disillusioned, and sensitive—and man of weary honor threading his way (in Chandler's phrase) "down these mean streets" among blackmailers, pornographers, and murderers for hire." In an article published on June 5, 2013 in Los Angeles Magazine titled "The 10 Most Iconic Cop Shows SetIn the Mean Streets of L.A", the author writes: "'Down these mean streets a man must go who is not himself mean...' Raymond Chandler, the patron saint of pulp noir, once wrote." On and on it goes. It is, in fact, almost impossible to find an article or a blog posting that does not in some way directly connect Chandler to the phrase "mean streets," so pervasive is the idea that the phrase is his. The phrase does seem so distinctly American and it's natural to apply such a muscular phrase to a writer like Chandler, who did indeed prowl back alleys in his fiction. But another writer deserves credit for the phrase. British author Arthur Morrison published a book called "Tales of Mean Streets" in 1894. "Mean" didn't mean "angry" or "dangerous," but instead indicated someone or something that was miserly or broken down. Morrison's book is a portrait of the denizens of the East End of London, the location of grinding, oppressive poverty at the time the book was published. Chandler, who grew up in London and was a British citizen almost to the end of his life, almost certainly was aware of that book. In "The Simple Art of Murder," the essay from 1944, the detective writers Chandler most admires are English. After mentioning a few examples of detective fiction, Chandler says: "The ones I mentioned are all English only because the authorities (such as they are) seem to feel the English writers had an edge in this dreary routine, and that the Americans, (even the creator of Philo Vance – probably the most asinine character in detective fiction) only made the Junior Varsity." Chandler also references The Detection Club in this essay, which was founded in London in 1930 by a group of esteemed mystery writers. Chandler described the group as the "Parnassus of English writers of mystery. Its roster includes practically every important writer of detective fiction since Conan Doyle. Both Morrisson and detective fiction writer H. C. Bailey were among the co-founders, so the link is made. More about Bailey in a minute. Morrison's book might be dated but is not dull. It's full of brutes, drunkards, good women turned bad — all of whom live on the south side of town. "Of this street there are about one hundred and fifty yards--on the same pattern all. It is not pretty to look at. A dingy little brick house twenty feet high, with three square holes to carry the windows, and an oblong hole to carry the door, is not a pleasing object; and each side of this street is formed by two or three score of such houses in a row, with one front wall in common. And the effect is as of stables. "Round the corner there are a baker's, a chandler's, and a beer-shop. They are not included in the view from any of the rectangular holes; but they are well known to every denizen, and the chandler goes to church on Sunday and pays for his seat." A "chandler" is a person who was the household head of wax and candles. Someone who, in other words, helped shed light in dark places. It's easy to picture a young Raymond Chandler reading this passage, and envisioning himself that very man, the chandler, living among these people and trying to make his way in the world. But after Morrison, it seems as though another British writer, H.C. Bailey, wrote of these same "mean streets" a decade before Chandler himself used the phrase. Bailey (1878 - 1961) wrote stories featuring the medical detective Reggie Fortune and a sleuth by the name of Josiah Clunk. Bailey was highly regarded enough to have been included in a Modern Library anthology called "Fourteen Great Detective Stories" that was published in 1949. "The Yellow Slugs" is a tough little story that has his medical detective Fortune (certainly a harbinger of private eyes that have names with double meanings) investigating an incident with a young brother and sister that may or may have not been attempted murder. When the mother of the two kids tries to convince the police that the incident was accidental, Fortune has this exchange with another cop named Bell that has all the earmarks of the style that was to become known as "hard-boiled:"
"She's been here, half off her head, poor thing," said Bell. "She wouldn't believe the boy meant any harm. She told me he couldn't, he was so fond of his sister. She said it must have been an accident." "Quite natural and motherly. Yes. But not adequate. Because it wasn't an accident, whatever it was. We'd better go and see the mother." "If you like," Bell grunted reluctantly. "I don't like," Reggie mumbled. "I don't like anything/ I'm not here to do what I like." And they went. "People were drifting home from the common. The mean streets of Blaney had already grown common in the sultry gloom." There are no mean streets in Chandler's first published story, "Blackmailers Don't Shoot," from 1933, just assorted unsavory characters who are trying to outshoot or outsmart the other guy. There are cigarettes and hard faces, and Chandler, writing fiction for the first time, seems to have emerged fully-formed. This is a story where a guy named Mallory is trying to blackmail a movie star over some sexually explicit letters he has come across — a plot device in countless imitations. Chandler also tosses off a phrase that would pop up elsewhere. When the cops are trying to strong-arm some information out of Mallory, one of the cops says: "Maybe you better talk, bright boy." "You're a pretty bright boy, aren't you?" "Well, you're not," said the other little man. "Is he, Al?" "He's dumb," said Al. He turned to Nick. "What's your name?" "Another bright boy," Al said. "Ain't he a bright boy, Max?" So Chandler made his mark from the beginning, which is an astonishing achievement for any writer. The phrase "mean streets" is now more commonly associated with the Martin Scorsese movie from 1973 (the title of which may have been inspired by a memoir written in 1967 titled "Down These Mean Streets," by Piri Thomas about his life of crime in Spanish Harlem) than it is with the noir writing of the 1930s and 40s. Chandler himself may now be an anachronism. Philip Marlowe has been replaced by Jason Bourne and even a testosterone-driven Sherlock Holmes. No one throws punches any more, let alone lights up a cigarette. But on the 125th anniversary of his death, it's good to remember that even if Chandler didn't create these mean streets, he sure did populate them more colorfully and more vividly than any writer before or since.